(WMC-TV) - The parents of missing West Tennessee nursing student Holly Bobo said they call the TBI every day hoping for a clue to their daughter's disappearance. The waiting and not knowing has been painful for the Bobo family. They said they have faced rumors from people in the area and constant speculation. "I do kind of get in tense panic attacks when I have to leave the house, and of course I can have my house phone forwarded to my cell phone, but I still have a real problem with that or being out in public and thinking everybody is looking at me," said Holly Bobo's mother Karen Bobo. 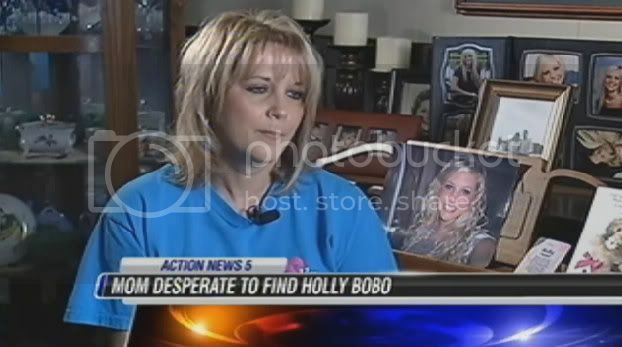 Holly Bobo's brother, Clint Bobo, has been the target of most of the speculation. He is the last person who saw her being led into the woods by her house. This picture reminds me of the pictures of Cindy Anthony in Caylee's room, completely posed and disingenuous. Holly's cell phone? Considering my doubts that the alleged abduction ever happened ... I believe that Holly's cell phone was in the possession of her family or Drew Scott at the time of her demise. The lunchbox was planted as a part of the original fabrication and staging but the cell phone planting was a afterthought. Answers to the follow questions directly from the lips of Clint, Karen, Dana and Drew as well as official answers from TBI/LE spokespersons have never been forthcoming. Why? 1. Did Karen and Clint attempt to contact Holly on her cell prior to the 911 call. 2. Did Karen and Dana drive separate vehicles. 3. What time did Karen and Dana leave the home. 4. Was Holly home when Karen claimed she spoke to her at 4:30 AM. 5. What was the reason Karen spoke to Drew prior to learning of the scream/s? 6. Was Drew at the Bobo home in the hours prior to the dawning of that day? 7. Did Clint, Karen, Dana and Drew submit to and pass polygraphs? 8. Have Clint, Karen, Dana and Drew obtained legal counsel and are no longer cooperating with the investigation? 9. Who is the neighbour/son who heard the scream and when does she/he reside in relation to the Bobo residence. 10. Were cell phone records requested and hard drives seized. 11. Why did Clint not attempt to assist his sister when informed she was at risk? Why did he not run into the woods ... jump on an ATV. 12. Was the Bobo and Scott residences/properties considered a crime scene and searched accordingly. 13. In the process of elimination were Clint, Karen, Dana and Drew ... those closest to Holly ... considered persons of interest and investigated accordingly? 14. Did Karen make Holly's breakfast and lunch prior to leaving for work? 15. Did Karen normally arrive at work prior to 7:30 AM? 16. Why was Clint home on the morning of April 13th? 17. Why did Karen speak to her mother prior to being informed of the scream/s? 18. Why has 911 calls never been released? It makes sense that Karen would have shared in interviews all the happenings encompassing the time she last saw her daughter until the she placed the 911 call ... an approximate three hour span. JAAAANE!! Ask Karen to provide from her perspective a timeline/chain of event encompassing EVERYTHING that took place from the moment she got up until she placed the 911 call. So many questions that inquiring minds were anticipating answers to in that interview were not asked. Why? Was the interview that provided more questions/suspicion than answers controlled? I think JVM is just a very poor interviewer, and she is always watching the clock as well. She never has anyone on long enough to do any good. Janet ~ thank you so much for your continued questions/mullings over this incredibly strange case. I check every day to read your questions and thoughts. Thanks. Hi Janet You've raised some interesting questions and believe me, I would like to know the answer to some of the questions too. However, we need to keep in mind The State of Texas doesn't have The "Sunshine" Laws like Florida. LE isn't going to release things such as the 911 calls in an ongoing investigation because it may compromise the investigation, unless it serves a purpose for solving the investigation. The same with some of the other information. They won't release information unless they feel it will help solve the case. What purpose would it serve to solve the case if all the information you listed were released? It might in fact compromise the investigation by tipping off some people. There are a lot of questions I'd like answers to too. Are there any Tennessee missing person cases on the SM site? A comparison in regards to the role of LE/TBI/FBI would be interesting. Florida Sunshine Law? The Casey Anthony case reveal 911 calls almost immediately and ... there were dump after dump of case documents release ongoing. In the JVM interview .. it was obvious that Jane was not buying Clint's conflicting answers to her questions. He could not keep his story straight for 20 minutes. I hope investigators has siezed into evidence a video of that JVM interview from CNN. I'm sorry I didn't make my post very clear Janet. I shouldn't have used the State of Texas, which I'm more familiar with. I should have used the State of Tennessee. I've had my second cup of coffee now. Janet, the Tennessee Open Records stuff looks complicated, but I've chosen the 911 recordings as a place to start, and here's what I found. (Google is my friend) The point I was trying to make earlier is that not all states have the same laws in regard to transparency and such and it makes it very confusing. Plus, there seems to be ongoing legislation to change things, as I can show here in the State of Tennessee. These are recent. AN ACT to amend Tennessee Code Annotated, Title 7, Chapter 86, Part 1 and Title 10, Chapter 7, Part 5, relative to confidentiality of emergency service calls. whose voice is recorded, or upon order of the court. The Tennessee Senate has passed a Bill to block public rebroadcasting of 911 emergency calls without the written consent of the person whose voice is recorded. According to Newschannel 9 the 23 to 8 vote bans media broadcasts of 911 tapes. That includes all recordings, including that final radio call for Sergeant Tim Chapin, which was played 2 weeks ago. The Senate’s amended version does not include banning written records of those calls. Meanwhile, the House is aiming to ban the text, and that’s where the bill is headed next according to Newschannel 9. Is this information public record? The amended version of the Bill declares that such calls are public record , but does a limitation on rebroadcasting or publication of the transcript actually impede public access? Should the government be concerned about privacy rights of people who call 911 and protecting the dispatchers and police (who work for the public) from having their official radio conversations broadcast? The Freedom of Information Act requires the release of any information related to any government agency or public agency, including emails sent and received by government employees and agents. There are notable exceptions such as matters relating to national security, or information which is Germain to an ongoing investigation. Obviously the public should not expect the police to release key information which would jeopardize a criminal investigation or release the names of certain witnesses and place them in danger, etc. But 911 tapes and radio calls do not typically involve any of these issues. Life beckons outside the computer room. Hubby and I are taking two of our grandkids to Disneyland next week and ... picking up our package at the travel agent is where it is at this morning and then it is a trip to the salon to "wash this grey right out of my hair". Anyways ... I will read all the info you posted later. Your smooch was a great start to a busy day. You're welcome Janet. It sounds like you're going to be busy. Three days following the April 13th TBI Media Release which stated that Holly was "dragged" across the carport towards the woods ... another version was revealed in a press conference. Holly was not "dragge"d ... she was not "forced" ... she "walked" towards the woods with who Clint perceived to be her boyfriend. Considering investigators checked the Bobo property for "drag" marks implies that the words in the April 13th Media Release reflected Clint's original statement. Did the changing statement revealed April 16th by TBI John Mehr come about when investigators questioned Clint as to why there were no "drag" marks ... why he did not attempt to assist his sister who was at risk? Is D'Lynn Burton the woman who allegedly heard the scream and contacted Karen at work ... D'Lynn Burton Burton who is a neighbour ... D'Lynn Burton who allegedly is a friend of Clint Bobo? The neighbour who contacted Holly's mother regarding the scream has never been identified by Karen in interviews or LE/TBI media spokespersons. This is the oddest thing, yet I've seen from a parent of a missing child. I am sorry but even The Anthony's had enough sense to not broadcast where the funds for vacations they took came from. I can't imagine that a mother in the face of the gravity of the issues at hand, is mounting a T-shirt sale for a vacation for her missing daughter. My Hinky Meter is going crazy! Considering the truth is constant ... the changing stories regarding the observations of the ONLY witness encompassing the alleged abduction ... the changing stories revealed by TBI spokespersons and ... the changing stories revealed in Clint Bobo's own words ... imply that an abduction never happened and Holly brother harbors the truth ... the truth regarding what happened to his his sister and ... the truth regarding others who have knowledge. My speculations begin from one place of truth and ... that one place of truth is Clint Bobo's changing stories regarding the happenings encompassing the alleged abduction of his sister ... the changing stories that imply an abduction didi not happen. I ask myself. "If the abudction did not happen in that 30 minute timeframe prior the placing of 911 calls ... when did something happen to Holly Bobo?" I SPECULATE that Holly Bobo met her demise in the hours prior to the dawning of the morning of April 13th. I SPECULATE that Karen, Dana, Clint and the elusive Drew all have knowledge. I SPECULATE that a fabrication and staging was collaborated ... Clint played the staring role and ... others made certain they had alibis. I SPECULATE that when Clint was chosen to play the staring role ... the staring role as a witness to an alleged abduction ... one crucial fact was overlooked ... the crucial fact that a fabricated story would requires a good memory as interrogations and interviews would dictate that fabricated story would have to be conveyed over and over again.